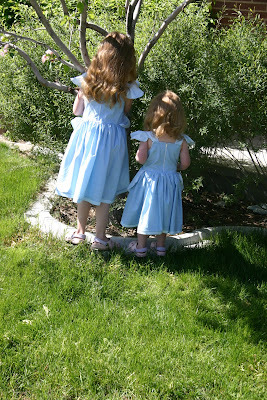 The final two Princess dresses. (They are not ironed so ignore the uneven hems and such... I just have no more energy for these things. All the hair accessories are done now too. 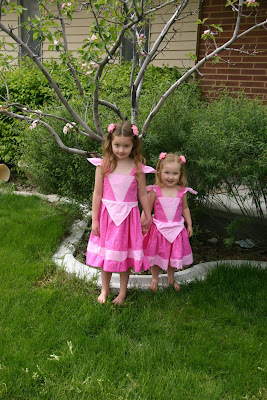 I didn't have them finished for the first round of princess dress photos. So glad to be done! 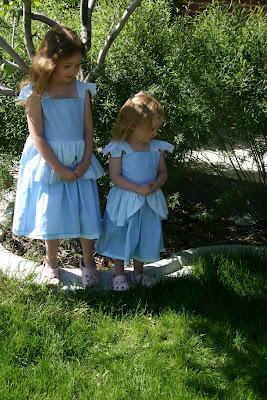 I wanted the girls to have princess dresses for our trip to Disney. 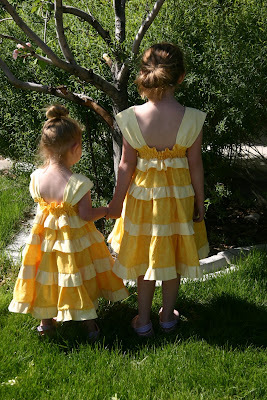 With the HOT weather we'll be facing, I wanted to modify the princess dresses to be SUN-dresses instead. These were fun to create!!! 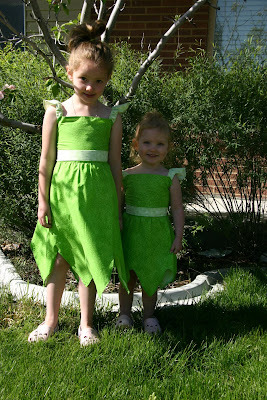 And I think the girls will stay cool and comfortable in them while walking around the Magic Kingdom! 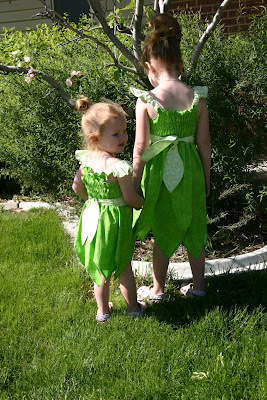 A favorite around here is TINKERBELL! Photos soon of Snow White and Sleeping Beauty! 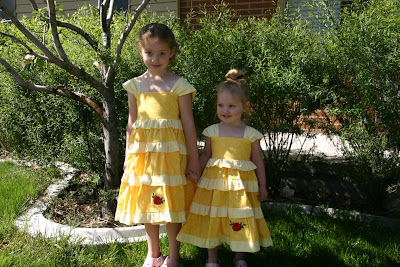 "Minnie" outfits for the girls. Seriously... turn me in for blog neglect. Things *could* be crazier around here, but not by much. Here are some random pieces from our lives recently. Brian's last final is today. Then "we" are done with school. Man alive, I can hardly wait to have him home and not stressing about school! I'm so glad that he went back and finished up - it was not an easy decision to go back... but he's DONE! Happy Graduation to Brian! YIPPEE! Taylor still has his nose in a book... he read the 6th Harry Potter book in record time so he could start book 7. This school year he has read books 4, 5, and 6. I would not be surprised if book 7 is finished by the time school is out. He read for over an hour last night and is already on page 220. Jordan is following in Taylor's footsteps and asked if he could start the first Harry Potter book. I told him it might be difficult and to not get discouraged if he needed to just read another book instead. He's excited for the challenge - He's been reading smaller chapter books for weeks now and can read ones that are 75 pages easily in an evening. I'm so glad they like to read! Jordan was so sad to bring me his spelling test the other day. He missed one word. He has not missed any words since the beginning of the year. He was SHOCKED to see a minus one, but admitted to his "mistake" and vowed to do better. Where did I get this kid?!?!? Madison has Kindergarten Orientation tomorrow. I'm hoping that Kindergarten won't bore her to pieces. She's starting to read a lot more, corrects kids work at preschool, and really is an adult trapped in a 5 year olds body. Her dance performance is coming up and she's way excited. While all the family is counting down to the Disney World Trip, she is counting down to the dance recital. She says that she'll be excited for Disney AFTER dance is over because dance comes first on the calendar. Okay then. Reagan has started talking in her sleep and tells quite the tales. When she wakes up she has a hard time distinguishing from her dreams and reality. If she's talked in her sleep about Jordan taking something away, she's not nice to him the rest of the day. While cute, the little night conversations are getting tiresome as she comes into our room around 2:00 AM to sleep with us and Brian and I are both too exhausted to haul her little fanny back into her own bed. We'll keep her anyway.